The Iroquois Confederacy was a cultural and political union of several Native American tribes residing in the present-day state of New York. The Iroquois Confederacy was a confederation of Native American Indians which was originally composed of 5 tribes consisting of the Mohawk, Oneida, Onondaga, Cayuga and Seneca peoples. The Iroquois were also known as the Haudenosaunee or the "People of the Longhouse". The Longhouse was a long, narrow house that was traditionally built by the Iroquois. The tribes of the Iroquois confederacy belonged to Eastern Woodlands culture group. The union created a powerful alliance of related Iroquoian tribes and peoples. The Iroquois Confederacy was also known as the "League of Peace and Power". The Iroquois Confederacy was first founded c1450, prior to major European contact, and initially consisted of five tribes: the Mohawk, Oneida, Onondaga, Cayuga and Seneca tribes, which were known as the Five Nations. The Tuscarora tribe joined the Confederacy in 1722, as non-voting members of the league, and the collective tribes became known as the Six Nations. The powerful, and brutal, Iroquois coalition grew quickly by invading neighboring tribes and absorbing their land into Iroquois territory. The Iroquois Confederacy aimed to create an empire by incorporating subservient, conquered peoples. The Iroquois Confederacy initially consisted of five tribes who were in close proximity of the Iroquois territory. The Mohawk tribe lived along the Mohawk River of the Mohawk Valley in upstate New York to South Quebec and East Ontario - Possessors of the Flint. The neighboring tribes were conquered by the Iroquois Confederacy and their lands absorbed into their territory. The Iroquois nation were a war-like people and there was continuous inter tribal warfare and conflicts with the tribes of the Powhatan Confederacy. The young warriors were trained to become immune to pain and they had little respect for any signs of weakness. Honor was acquired by bravery and aggression in warfare. The Iroquois tribes were merciless in their treatment of their enemies and captives who were tortured and sometimes roasted alive - their remains were consumed in cannibalistic feasts. Their incessant warfare was weakening the Iroquois tribes which became a major concern of two men. The prophet Deganawida who was a spiritual leader and his disciple Hiawatha who was a wise man, chief of the Onondaga tribe who acted as the spokesman for Deganawida. Deganawida and Hiawatha travelled across Iroquois territory talking about their ideas and eventually took their message of peace to a council meeting of the five nations, or tribes. Dekanawida and Hiawatha united them into a League of Nations or the Iroquois League. They brought a message, known as the Great Law of Peace, to the warring Iroquoian nations. The Great Law of Peace was the basis of the Iroquois Confederacy Constitution. Dekanawida was given the title of 'Great Peacemaker'. There are 117 Articles in the Iroquois Confederacy constitution - read the Articles to gain a great insight into their Constitution and the Confederacy. The Iroquois Confederacy constitution was recorded with the help of a memory device called wampum - referred to as the Hiawatha Wampum Belt. Wampum are the traditional, sacred shell beads of the Iroquois tribes which were used for recording special events. The Iroquois Confederacy Wampum belt contains symbols for each of the original five tribes in their geographic order. The first symbol represents Seneca tribe, the centre arrowhead symbol represents the Onondaga tribe, the next symbol the Oneida tribe and the end symbol the Mohawk tribe. Each of the symbols is linked by a line running between them which symbolised peace in the Confederacy. The Great Peacemaker used a white pine, called the Tree of Peace, to symbolize the peace established by the Iroquois Confederacy. The branches of the Tree of Peace represented protection. A far seeing eagle sat upon the top of the tree to symbolize a warning system if the tribes were in danger. Beneath the roots of the Tree of Peace a weapon was buried which symbolized that there would be no fighting between the Iroquois tribes. The Longhouse was used by Deganawida and Hiawatha as a symbol to represent the union, the culture and the traditions of the Iroquois Confederation and how their territory should be shared. The three largest tribes held important positions within the confederation which relate to the structure of the longhouse. The Iroquois Confederacy constitution was known as the Gayanashagowa or the "Great Law of Peace". The Confederacy was guided by some basic principles. The need for justice and balancing of rights and obligations. The need for peace among individuals and between groups. The need for authority and power. Deciding upon individual matters of Law and order remained the internal concern of each tribe, but the Confederacy legally prohibited cannibalism. The Great Law of Peace is divided into 117 articles. The Beaver Wars (1640 - 1701), also called the French and Iroquois Wars, were terrifying and brutal wars fought by tribes of the Iroquois Confederacy and the French and the Indian tribes who were their allies including the Huron, Algonquins and the Mohicans. The Iroquois Confederacy, and in particular the Mohawk tribe, had established trading links with Dutch exchanging beaver skins for firearms (the arquebus). The Iroquois Confederacy wanted to extend their trading activity and gain new territories. Bloody battles ensued and the Iroquois Confederacy destroyed several large tribal confederacies including the Hurons, Eries, Neutrals and Susquehannocks. The French and Indian War (1688-1763) was between France and Britain for possession of North America. During the French and Indian War, the Iroquois Confederacy sided with the British against the French and their Algonquin allies who included the Huron Tribe who were traditional enemies of the Iroquois. During both Queen Anne's War and King George's War, the Iroquois Confederacy maintained the policy of neutrality. The Iroquois believed that aiding the British would also bring favors in trade and land agreements after the war. The American Revolution broke out in 1775 and was disastrous for the Iroquois Confederacy. The confederacy, as such, refused to take part in the conflict but allowed each tribe to decide for itself. During the American Revolution the Oneida and the Tuscarora sided with the colonists, whilst the Mohawk, Seneca, Onondaga and Cayuga remained loyal to Great Britain. 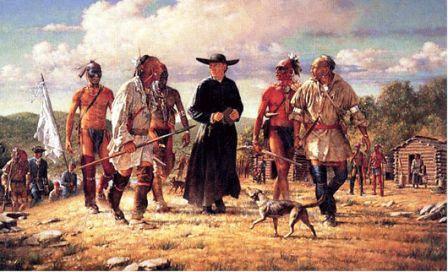 This marked a major split among the Six Nations of the Iroquois Confederacy. The fall of the Iroquois Confederacy followed the American Revolution. The Military defeat of the British and their Indian allies brought ruin and an end to Iroquois independence. The Iroquois were forced from their homelands and settled on reservations in western New York state and Canada.